British seed varieties more than tripled the average yield of Kenyan seeds in the east African country following trials. British potato seed planted in Kenya has more than tripled the average yield in the east African country following successful trials. Four seed types were imported to Kenya for testing after a bilateral trade agreement was struck between the Scottish and Kenyan governments late in 2016. 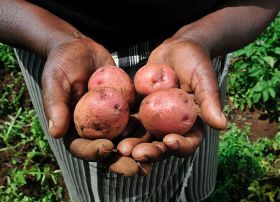 Potato growers in Kenya have struggled with low yield and disease, with an average crop of 10 tonnes per hectare, as the majority of farmers use poor quality home saved seed varieties. The AHDB and Science and Advice for Scottish Agriculture (SASA) setup trials on three farms to assess their yield and quality, with the aim of providing a new export market for British seeds. All four named varieties sent out to Kenya performed well, with Cara the most successful across all three farms, producing over 50 tonnes per hectare. Hermes and Russet Burbank also grew well with an average yield of 41 tonnes per hectare, while Atlantic produced 35 tonnes per hectare. Rob Burns, AHDB head of crop trade market development, said: “We are really pleased to see our seed performing so well in Kenya, although not surprised, as all these free varieties grow well in hotter, drier climates. “It’s particularly positive to see that three of our four varieties are performing at a similar standard or better than what’s called the ‘check variety’, which in this case is a high quality variety called Dutch Robyjin. Even Atlantic, which is not quite yielding as well, is not far behind. Jackie Gibson, exports coordinator at SASA, added that a repeat of their success next season could open up strong opportunities for seed exporters. “I think we are likely to see the strong results we have seen in the first season replicated in the second and if we get good yields, combined with other positive characteristics, such a better dry matter and disease resistance, we will definitely see GB varieties added to the national list,” she said.